﻿ BATTLE ROYALE REMASTERED « Haikasoru: Space Opera. Dark Fantasy. Hard Science. Koushun Takami’s notorious high-octane thriller is based on an irresistible premise: a class of junior high school students is taken to a deserted island where, as part of a ruthless authoritarian program, they are provided arms and forced to kill one another until only one survivor is left standing. Criticized as violent exploitation when first published in Japan—where it then proceeded to become a runaway best seller—Battle Royale is a Lord of the Flies for the 21st century, a potent allegory of what it means to be young and (barely) alive in a dog-eat-dog world. 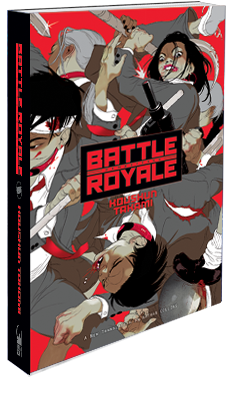 Made into a controversial hit movie of the same name, Battle Royale is already a contemporary Japanese pulp classic, now available in a new English-language translation. Battle Royale Double Duty Winners! Koushun Takami was born in 1969 in Amagasaki near Osaka and grew up in Kagawa Prefecture of Shikoku (the fourth largest island in Japan), where he currently resides. After graduating from Osaka University with a degree in literature, he worked for a newspaper company, Shikoku Shinbun, for five years, reporting on politics, police reports, and economics. Also, he attended Nihon University’s liberal arts correspondence-course program and acquired an English teaching certificate for junior high and high school. Battle Royale, completed after Takami left the newspaper company, was his debut work and his only novel published so far. With its publication in Japan in 1999, it received widespread support and became a best seller. Battle Royale was serialized as a comic, made into a feature film in 2000, and has been translated into more than ten languages. Since its initial release, Battle Royale continues to be a cult favorite in Japan and internationally. In 2012, Battle Royale: Angels' Border, a spin-off manga scripted by Koushun Takami, was released. Yuko Sakaki raced up the stairs and was out of breath as she emerged at the top of the tower. The lantern room had just enough space to walk around the Cyclopean eye of the Fresnel lens in the center. The storm panes offered a view of the cloudy sky. To her left, a low door led to the outside catwalk. Yuko desperately opened the door and went outside. This high up, the wind was stronger than she’d expected and smelled strongly of the sea. The water unfolded before her. The sea reflected the overcast sky in a muted indigo upon which white waves wove an intricate fabric. Yuko moved to her right around the lantern deck. Across a small clearing at the front of the lighthouse, the northern mountain loomed. A little to the left, an unpaved access road wove around the base of the mountain. A lone white minivan had been left beside a meager gate at the mouth of the road. Yuko held the steel railing. Beneath, she could see the roof of the attached single-story building—and of the room where she had been only moments ago. She followed the handrail around the lantern deck but did not find what she had expected—a ladder. She hadn’t taken a turn on watch yet and wasn’t familiar with the outside of the lantern room. There was no way down. She’d trapped herself in a dead end up in the sky. Panic nearly overcame her, but she gritted her teeth and fought it down. With no ladder, she’d have to jump. Breathing heavily, she returned to where the building lay below, and she looked down again. It was a long way down—not as bad as to the ground, but still a very long way. It was, in fact, too far to jump, but before she could reach a rational decision, that image flashed through her mind again. Only this time, the other girls were gone, and it was just her there with her head split open. Blood sprayed up and covered Shuya Nanahara’s face. She had to escape—no matter what it took. She couldn’t not escape. And she was out of time.